I haven’t seen much around the Bellarine lately, as I have been holidaying in Bermagui, which is located on the southern coast of NSW. I usually see a few different and new birds in Bermagui, but this year I didn’t see one new species. I did have fun chasing white-bellied sea eagles around the cliffs and (unsuccessfully) looking for superb lyrebirds in the forest. I have to thank Kevin for sending me some photos taken at Blue Waters Lake and Begola Wetlands in my absence. 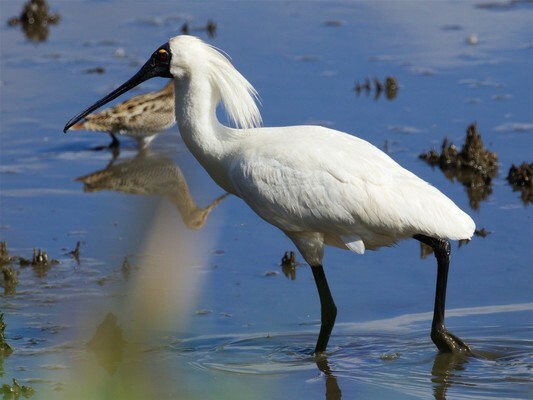 It looks like Begola is a hive of activity at the moment, with royal spoonbill, yellow-billed spoonbill, black-fronted dotterel, Latham’s snipe, chestnut teal, grey teal, white-faced heron and purple swamphen featuring in Kevin’s photos. He also took a lovely photo of a reed warbler at Blue Waters Lake. Thanks so much Kevin for sharing your wonderful photos and observations. 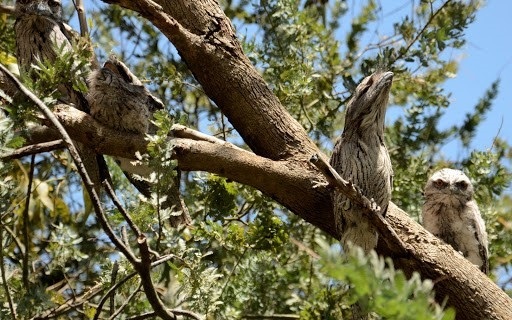 I also received an email from John, with a photo of a tawny frogmouth family, taken around Ocean Grove. There’s nothing better than receiving a photo of some tawnies, and thank you so much for sending it. I had my first trip to Mimosa Rocks while in Bermagui. I wanted to check out some NSW hooded plovers, but alas I didn’t see any. In 2003/04, the NSW population of hooded plovers was estimated as 19 to 25 pairs, or not more than 50 birds (NSW Field Ornithologists Club annual bird reports). A more recent estimate placed this population at fewer than 20 breeding pairs (i.e. fewer than 40 birds) in NSW (expert advice 2007). Much of the hooded plover’s estuarine habitat in NSW has been, and continues to be, destroyed or degraded by coastal development, engineering works and human population increase. How shameful. Closer to home there are a few hooded plover nests along the beaches where chicks are due to hatch, so please keep dogs on the lead and take note of signs, to give the birds a better chance of surviving. 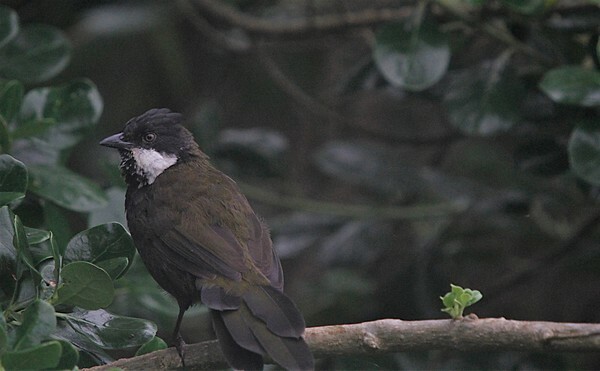 In Bermagui I was fortunate to photograph the eastern whipbird, which is one of my favorite birds. The whipbird’s long whip call is one of the most characteristic sounds of the Australian bush. The male makes the drawn out whip crack and the female usually follows quickly with a sharp ’choo-choo’. The whipbird is found in dense bush, so they are very hard to photograph, but I managed to capture a photo of a male at the Bermagui Golf Club during the early morning (before the golfers made it to the 8th hole, so I avoided being hit on the head by a golf ball). I also found some variegated fairy wrens in Bermagui. 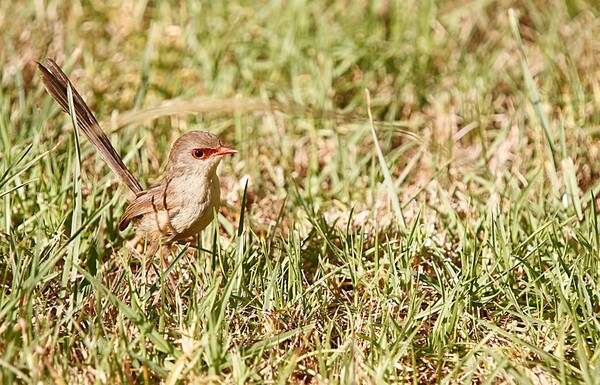 There was an article in a Birdlife Australia magazine about a year ago on how to distinguish the various species of female fairy wrens from each other. 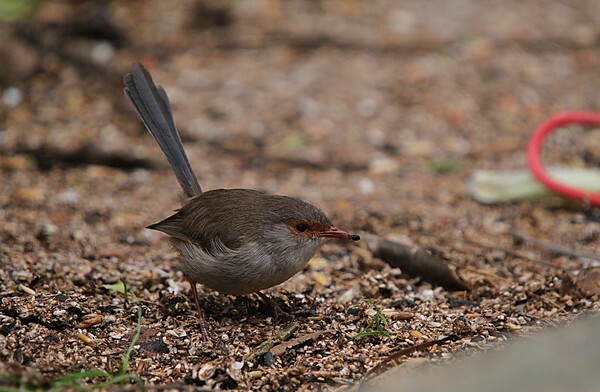 The female variegated fairy wren has a dull grey-blue plumage colour, while female and immature superb fairy wrens are mostly brown, with adult females having a pale greenish gloss on the otherwise brown tail. The variegated fairy wren is slightly larger in size and has a longer tail than the superb fairy wren. The red-orange area around the eye is darker in a variegated fairy wren. I thought I would put some photos here for comparison.